Can be used for non aero models 02-05 if the spoiler is trimmed. I purchased this for my 2001 9-5 wagon. It bolted on and fit well, but this should say "flexpipe back" or "intermediate pipe back" exhaust system because THIS DOES NOT BOLT UP TO THE CATALYTIC CONVERTER as is implied by the product description "cat-back." That would not be all that frustrating if it was disclosed or mentioned anywhere in the description, or if Maptun (or anyone) sold a 2.5" intermediate/flex pipe to go from the cat to the center muffler that comes with this kit, but I was unable to find one anywhere. 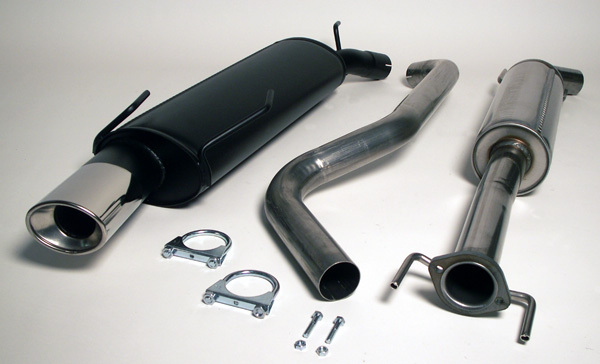 I suppose the solution is to buy their 3" downpipe kit as well because it looks like that might get you to the center muffler but thats a significant investment in addition to the cost of this kit. Overall good product at great price, ~$200 less than from local supplier including $85 shipping. I had great experience, shipping was fast, but it is a little misleading to call something a cat-back exhaust when it does not actually bolt to the cat. Tog ett tag innan jag fick systemet..... Men är mkt nöjd med det, låter bra, lagom ljudnivå, lätt att montera, snygg design och bilen blev piggare!